Staples is having a great sale this week! (I would go soon) Along with many items for $1 and even $.01 there is a $5 off $30 Purchase coupon, and if your store accepts competitors coupons (Salt Lake store does) you can use $10 off $25 Purchase Office Depot Coupon! (valid through 7/15) Thanks Cuckoo for Coupon Deals! 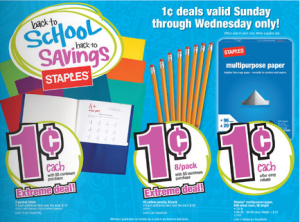 Go here for an Office Depot Moneymaker! !